- Harmonic tremor was on its peak today at 12:50 UTC but has been gradually decreasing little by little. - Involcan has published a great video showing their staff and the main events of the eruption period + some nice music on it. Congratulations to the INVOLCAN people for their dedication and great coverage ! - A new M 1.1 earthquake occurred at 10:54 on a depth of 23 km. Epicenter below Tacaron. - The Restingolitas, as the Smoking Lava Stones are called in El Hierro, are coming up at regular intervals. As our 2 good webcams are having server problems (also the Frontera webcams are down), we have to stay with the U-stream El Pinar webcam. He has a fairly good zoom, but as this is a fixed camera, he shoots almost always to the side of the SLS. The stones can be seen on the wide angle though. Keep looking. - At 10:08 reader Mariette wrote : From my apartment in La Restinga we clearly (and without binoculars) can see the plumes and big restingolitas bubbling up the last half hour. The volcano isn’t sleeping yet. Congratulations to this great team of observers. As our readers can see, nothing goes unobserved during this eruption. - Variable harmonic tremor fastly subsiding after a stronger period. Fascinating what the next step will be ! - At 04:48 a weak 0.9 earthquake occurred at a depth of 12 km below the crater area on the top of the island. As there is no consistent feeder area or depth (earthquakes epicenters are changing all the time in area and depth) the future of the eruption is very unsure and can be called as "surviving". - A strong burst which lasted about 2 minutes occurred at 20:28. In general we can say that harmonic tremor did increase slightly over the last 8 hours. A new phenomena for the last couple of days is that hydromagmatic bursts seem to have returned. - Joke was talking tonight about a carried away stain in front of Tacaron, but at the same time some stirring brown water in that area ! She said it will probably simply the stain from the vent. We think that this has to be checked tomorrow. - In he daily visit to the CAP science center in La Restinga, IGN was talking about multiple emission points today. We remember the same from earlier helicopter images. - Joke sends her regards to all those people who enjoyed her participation to this report for the last couple of months and she also thanks those people sending her a happy birthday yesterday and today. - INVOLCAN sells a beautiful Wall Calender for 10 Euro. We can warmly advise to buy it, although they are still living in the 20e century (no Paypal or CC payment possibilities). Click here for the Involcan website. Update : After the translation from Julio, Involcan has replied that payments via Paypal will be possible from next Monday. - The Salvamar Adhara is still navigating around the stain with IGN people on board. 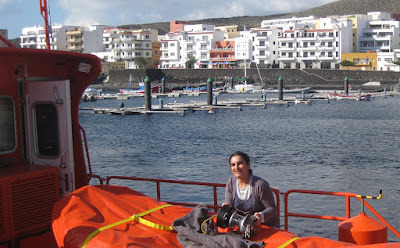 As we had written yesterday, IGN Carmen Lopez did plan to make this trip today to record underwater video near the vent. They are not using a high tech ROV, but an underwater video camera connected to a 200 meter long cable. They look like fishermen trying to catch the ideal images from the erupting material. Joke Volta saw the raw images yesterday and she told us that she saw, to her surprise a lot of jellyfish! She also saw some reddish color on the raw tape but was far from sure that it was incandescent lava. Besides the beautiful stain most of the day, Julio was amazed to find Smoking Lava Stones in his time lapse of the day. The smoking lava stones show up at 18:38 UTC while the harmonic tremor was slightly up. The video went too fast and finally the SLS could not be seen. He captured however a few images from that particular moment. Those people who want to see the time lapse of the entire day can click here. A full day is compressed in only 6 minutes. We at Earthquake-Report.com are recalling today's smoking lava stones to "Smoking Birthday Stones" and are offering them virtually to Joke for her birthday. Running slopes up and down, trying to find out the latest details just like a professional reporter, and this on her birthday, not too many people will do it. Happy Birthday Joke ! Joke has already seen the raw video of the Salvamar Adhara. She told us a lot of details of what she has seen and we are convinced that it will be very interesting. The video will be published later today or tomorrow. IGN will try to make the same trip tomorrow, but during the first daylight hours, hoping that the waves and current will be less than today. Julio did made a new time lapse specifically from the SLS period. On the video you will see them floating. - Those among you looking from time to time at the Village and eruption webcam must have seen the Salvamar Adhara along the stain. Joke waited for the arrival of the ship and tried to find out what they were doing. The crew and Carmen Lopez (IGN) said to her that they have been trying to make pictures with a special underwater camera. The camera was linked to a 200 meter long cable, although they did not use the full length. She said that they were not able to trace the vent as the visibility was too low and as the current was too strong. Let us hope that IGN will publish these pictures later today. - While we were all looking at the El Hierro volcano, Jorgen Aabech, a dedicated Norvegian volcano follower did wrote us about an minor eruption in the Red Sea. We checked a number of details, saw a small cloud but did not see any continuing eruption, so we discontinued following this event. As NASA satellite imaginary proofed the birth of a new island, similar to what we were looking at El Hierro, we compiled a lot of material and wrote an in-depth article today. Surtseyan eruption along the coast of Yemen forms a new island – Today eruption cloud + stain ! 29.12.2011 – On December 19, fishermen from Salif port city in the west of Yemen reported seeing an eruption with red lava rising to a height of 30 m. This was the first eruption the fisherman can recall from the area. Satellite images have proven afterwards that a new island has been born in the Zubair volcano group. - Joke Volta continues to invest enormous energy in this El Hierro volcano project. In the current stage, she make pictures during the morning and afternoon hours, she visits almost daily the CAP IGN science center and during the evening hours she traces all volcano related news on the Canary Islands. Without Joke this article would have been a lot shorter and less complete. The pictures below have been taken this morning. Click on the picture to see all of them in full size. - We are currently locked out of our own Facebook accounts for "a couple of days". Reason : they have found a trojan horse on the editing computer (the trojan was not immediately detected by anti virus software). 10 minutes later it was gone, but nevertheless the punishment was already given and was very severe. Our Facebook fans can still write on the page, so, we invite you to copy part of what you see here in the "Volcano" Facebook page. - We have a very troubled relation with Facebook, as they have blocked in July 2010 our Chile and Indonesian sites with over 35,000 fans, for a so called infringement against their rules (we tried to find out what we did wrong, but nobody could or wanted us to give an answer). The Fan pages were earthquake related. The blocking of these 2 pages was the reason that we diverted our attention to this site as we did not want to experience the same on a later date. - A new earthquake occurred at 09:04 UTC with a magnitude of 1.5 and at a depth of 14 km. Epicenter below land in the Tacaron area. - Although we only had minor harmonic tremor all night long, we were very surprised to see a beautiful stain this morning. It can still be seen at this time on the Eruption webcam. At regular times we see a jacuzzi in the middle of the stain and on the same location as the former vent. 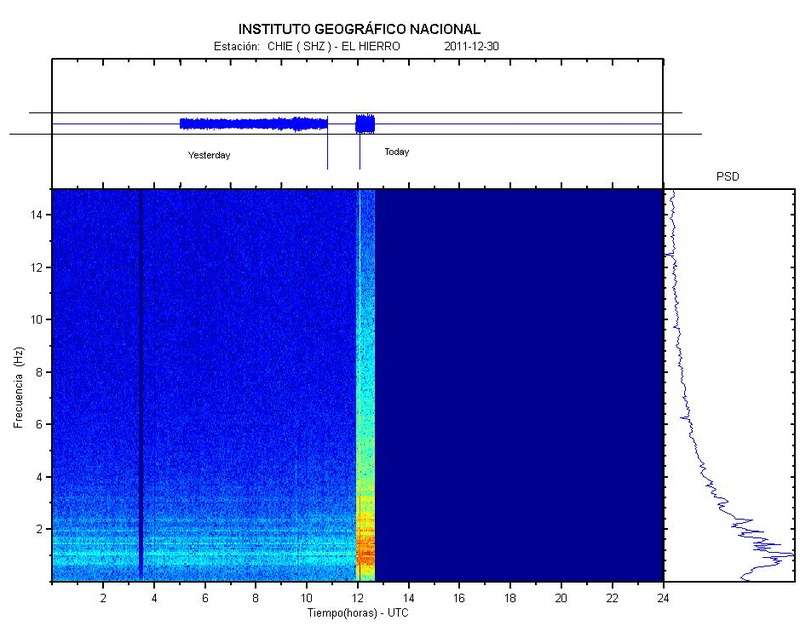 - El Hierro experienced a new M 2.3 earthquake at a depth of 18 km at 02:46 earlier today. Click here for the center. - We have just published the afternoon images of Joke Volta. Some are really beautiful. Click here to watch them. -The eruption is not over yet (see the great time lapse video with the Jacuzzi from Julio del Castillo Vivero). - During the evening hours the signal picked gradually up again, this after having collapsed at 20:45. Just before 20:45, a few strong bursts had occurred and a partial collapse could have been encountered. - IGN has listed a new earthquake which occurred at 17:09 UTC. The depth was 14.1 km and the magnitude 1.0. Epicenter right below the Tacaron cliffs. - Julio del Castille Vivero is doing great work since several weeks in recording one or more webcam images. The video below shows the revival of the eruption / vent and even a minor jacuzzi. The first video shows the renewed activity in a time lapse (faster speed) and the second video is the real time video. The time frame is from 17:16 until 19:07. - Joke went to the CAP science center and had a talk to the employee and with Carmen Lopez from IGN. Mrs. Lopez expects that the eruption is nearly over as the process was subsiding the last several weeks. Sge stressed that it will take a few days more before Pevolca will decide to clear all alert levels as the present condition has to be prolonged. The eruption stopped completely. There is NO longer a Harmonic Tremor signal indicating an ongoing eruption. As described below, we will see soon if the earthquakes pick up again or not. With such a flat tremor line and NO volcanic earthquakes, it is over for now. If the present situation goes on for a couple of days, we expect that the alert levels will be changed to green again. - At 06:52 a 0.8 magnitude earthquake occurred at a (unusual) depth of 9.3 km below Tacaron. This earthquake is certainly linked to the change in activity, although a direct link with the HT graph cannot be seen. - We might arrive at a crucial phase in the survival of the eruption. If magma pressure is still strong enough without being able to erupt (collapse of the vent), the earthquakes have to pick up again. If this does not happen or if the HT does not come back, the eruption is halted. - After some really turbulent harmonic tremor in between 05:00 and 06:00, harmonic tremor came almost to a halt. We do think that the eruption subsided a lot the last several days but that the current decrease has to be linked to a vent collapse. If this is the case the harmonic tremor will gradually pick up gain as the magma finds his way out. Another exhibition of the El Hierro Art Gallery. Again a set of incredibly beautiful images taken from the Guardia Civil helicopters by the Involcan scientists yesterday morning. Click on the images to see the 10 pictures in full size. - Joke reported seeing many circles and a beautiful colorful palette. The water near the vent turned gray muddy. - The time lapse video from Julio del Castillo Vivero from the morning hours shows very well the fata morgana of the right side stain. The area looks like a vast stain similar than the color of the real stain. Thanks to Joke Volta we knew immediately that it was sun glare and not a stain. The fata morgana came around the same time of increased harmonic tremor. - The Cabildo Telefonica La Restinga webcam shows what looks like a huge stain to the right of the image. We just called Joke Volta, who is in El Pinar at the moment, and she thinks that what we see is sun glare, not a stain. - we saw the helicopter from the Guardia Civil / Involcan hanging over the vent during the morning but no images or video have been published yet. - the La Restinga village webcam is working again. The eruption webcam is off-line since December 22 ! We do not know (nor the AVCAN) what the reason is ! - RTVC, the Canary Island Television broadcaster seems to have given up on their El Hierro eruption webcam operations . The webcam was no longer active since a couple of days. It hopefully remains on the mast as this webcam was by far the best from all available webcams. Nothing is 100% sure as long as the eruption did not stop completely. If the volcano goes again into a more active state (people following Etna eruptions do know what this means) the activity level can change in a couple of hours. - At 00:28 a very weak 0.6 earthquake occurred at a depth of 12.2 km. Click here for the epicenter location.